My curfew was the street lights, and my Mom didn't call my cell, she yelled time to come in. I played outside with my friends not online. If I didn't eat what Mom made than I didn't eat. Hand sanitizer didn't exist, but you COULD get your mouth washed out with soap. 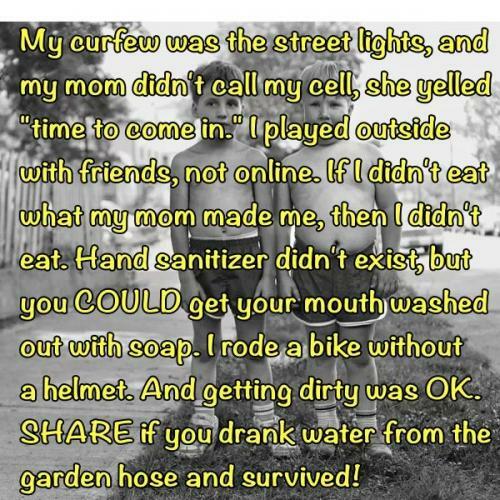 I rode a bike without a helmet, and getting dirty was OK, and we drank from the garden hose and SURVIVED! Remembrance of things past is not necessarily the remembrance of things as they were. The times you lived through, the people you shared those times with...nothing brings it all to life like an old mix tape. It does a better job of storing up memories than actual brain tissue can do. Every mix tape tells a story. Put them together, and they can add up to the story of a life. What you end up remembering isn't always the same as what you have witnessed. You can go other places, all right, you can live on the other side of the world, but you can't ever leave home. It shocks me how I wish for...what is lost and cannot come back. When people talk about the good old days, I say to people, 'It's not the days that are old, it's you that's old.' I hate the good old days. What is important is that today is good. It is impossible not to miss someone who was once a part of your life. Nostalgia is the mixed feeling when we come to think of a place, person or a thing. It can be combination of happiness, sadness or longing. Though it’s hard to remove nostalgia, we have to overcome it because Charles Kettering says, “you can’t have a better tomorrow if you are thinking about yesterday all the time ‘. True, it is not easy to do it practically since every day we cannot forget emotions and memories of some action or other. 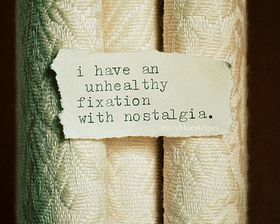 But nostalgia is unworthy and proves nothing beneficial for the betterment of life. Nostalgia is also experienced by those who are away from home for a long period of time. This is irresistible and cannot be avoided. The pain and sadness of missing the dear ones and not having them nearby, brings in nostalgia. Read these quotes on nostalgia and think over.